It is freezing in my apartment right now and turning on the heat too high makes my already dry skin crack. Even washing the dishes makes my hands look twenty years older. So, I leave it to my husband to take care of that. While I stand by and supervise and then apply my Crabtree & Evelyn hand cream. Today we want to have something warm and something toasty. After a few days of having nothing but turkey leftovers it’s time for a change. I’m thinking, something nice and warm and also refreshing. That is when I turn to soup. Just about any kind of soup will do right now. I am not fussy about that, I just want it fast. I would like to sit on my couch watching cheesy Christmas movies on lifetime with a big bowl of soup and some toasty bruschetta. I won’t even fuss about the crumbs being all over the couch. Really, I won’t. We had some stale Italian bread from thanksgiving and I can’t think of a better way to use it than make some toasty bruschetta. There is no recipe to make this really, all it is to it is just split it lengthwise, then, lightly brush the bread with some garlic infused olive oil or you can use some garlic butter. Then simply use your favorite toppings. I would suggest using fresh ingredients. I just went with what I already had in the fridge which was, white button mushrooms, Roma tomatoes, spinach and some natural cheddar cheese. Season that with some salt and pepper, little drizzle of extra virgin olive oil and then pop that in a preheated oven on 350 degrees for 10 minutes. Serve this with your choice of soup and you’re all set to brave the cold. Oh my…yum, yum, YUM! Such a great idea to just use veggies you have on hand. It’s like a long, skinny pizza. I must try this. Bruschetta is my absolute favorite appetizer to make for party guests, and yours looks wonderful! Super easy and always delicious. Thank you for sharing! A lovely bruschetta! So mouthwatering. I love bruschetta, yours look beautiful and delicious! Bruschetta is definitely a goody I enjoy. Like the spinach, tomato, cheddar combo you used. Looks delicious. I had to break down turn my a/c on today because it was too hot 😦 And yet, I made soup today anyhow, because maybe if I make it cool enough in my house, I can pretend it is really actually almost December and not summertime. 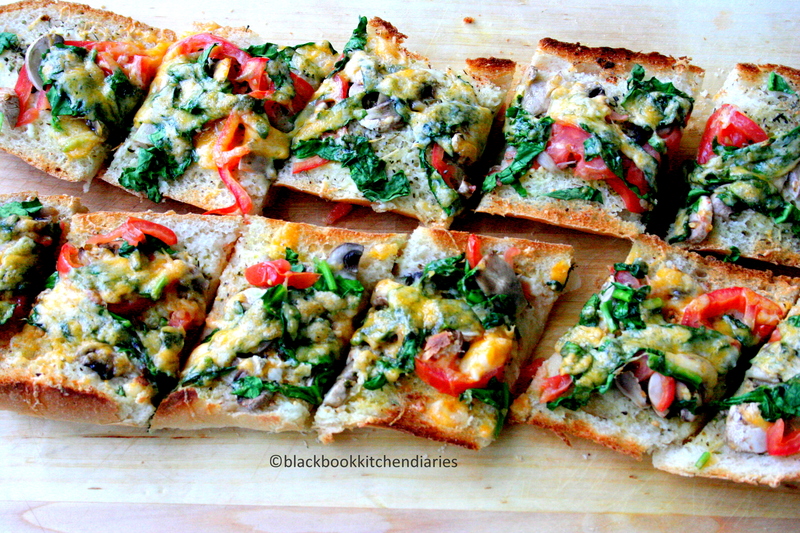 This bruschetta looks so yummy- like a french bread pizza! Love how you used what you had on hand. This looks absolutely delicious! I love this kind of comforting food! So wonderfully easy and tasty looking! That looks great! It looks very much like something called “Tuscan bread” that my dad used to buy my sister and I for lunch when we were small. 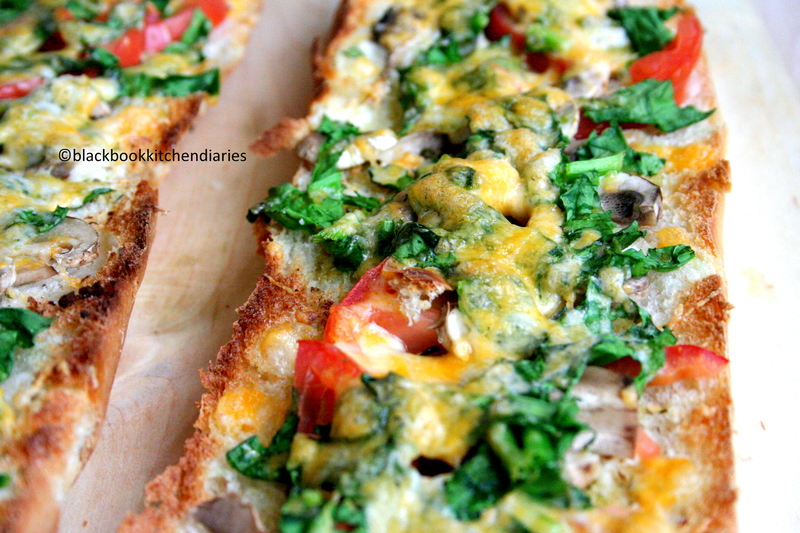 And I love layering things onto baguettes in a ‘bruschetta’-like way. Your combination looks very colorful and delicious too. This sounds great right about now as I am freezing under my covers. Huge fan of bruschetta and these looks great. It is such a great little tasty appetizer but minutest to make. Love it. The colors of this bruschetta are astonishing. And the melted cheese makes me drool. Your photographs are gorgeous! What is it about bruschetta – or crustatas or anything crispy and hot with something cheesy and gooey on top? I love them all…. and this one is so colourful and packed with such flavour! I can’t wait to try it. That looks yum! I have some leftover bread as well. Was thinking I might pop it in the freezer for bread pudding later but bruschetta would work too! Thanks for planting the seed. May I please have a bite!? These photos are making me super hungry – yes would go perfect with the soup I’ll be eating today for lunch! Great snack/lunch/dinner to get away from the bird leftovers! That looks incredible! I might make this for my holiday party next week! I wish I hadn’t just eaten a huge piece of tart for breakfast, this sounds better and healthier. I love using up leftover bread like this, I don’t like the cold either. this looks so comforting-perfect for this cold winter weather! i love all the colors-so vibrant! my house is so cold too and the heater makes my kids have breathing problems. now win. just freezing. i love how simple this dish is. you know this screams spring to me, a great way to get out of a cold funk. By the way, I just love the vibrant colours! Yum! I usually just toss my leftover bread to my chickens, but they may have to fight me for it now. What a great, simple way to make the most of what’s in the fridge and breadbox. Yum…soup never had it so good! Perfect post-holiday eating! You are right – this is a great way to use up stale bread. Oh that looks completely wonderful. I’d love to crunch into these yummy morsels (with or without any soup). oh my it looks soooo delicious!! i’m getting hungry here in the office in front of my computer! thanks for sharing, excellent recipe! Wow. The colors in your pizza/brsuchetta are just stunning. I want a slice badly. So badly that I may need to make this for lunch. My poor hands are getting dry too. It is time for my winter lotion routine. Thank you for sharing. I hope you have a great day! this toasty bread looks delicious! much different from what i think of when i imagine bruschetta, but i love that you can make it with whatever you have on hand. definitely adding to my mental “make” list! what a clever way to use up whatever u hae in the fridge, Im drooling right now!!! 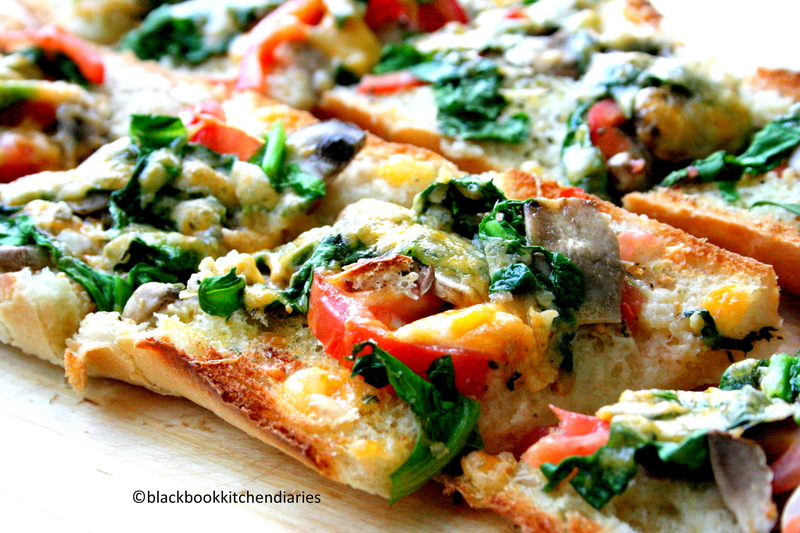 the variety of colors and textures on your bruschetta makes it especially inviting. Wow that looks really delicious 🙂 I hardly ever think to make these and they look like just the thing to crunch on with a nice bowl of soup. OMG, I want some of this like right NOW! Absoultely beautiful and appetizing. Thanks for sharing. What a great way to use leftovers- it looks fabulous! What a great idea! I love the colors and the mushroom addition. I’ve got a blog award for you, please stop by my site to pick it up! Fantastic Bruschetta! Your pictures are fantastic. They’re making my mouth water, and it’s only 6:30 am! Beautiful, colourful and delicious… This is my kind of food! Bruschetta is one of my favorite foods!!! YUMMY!! This looks so delicious!